I received an e-mail this morning from the head of marketing at the University of Nebraska Press … and attached was what should be the final version of the cover for my next book, Go, Flight! The Unsung Heroes of Mission Control. After what had become a little bit of an odyssey to determine an appropriate image, it looks marvelous. I love it. If your manuscript is an unborn child in the womb, that first glimpse of the cover is similar to one of those amazing 3D sonograms that allows you to begin imagining what the youngster will look like. It’s a stunning moment and one that never, ever gets old. After all that time and expectation … this … is … getting … real. 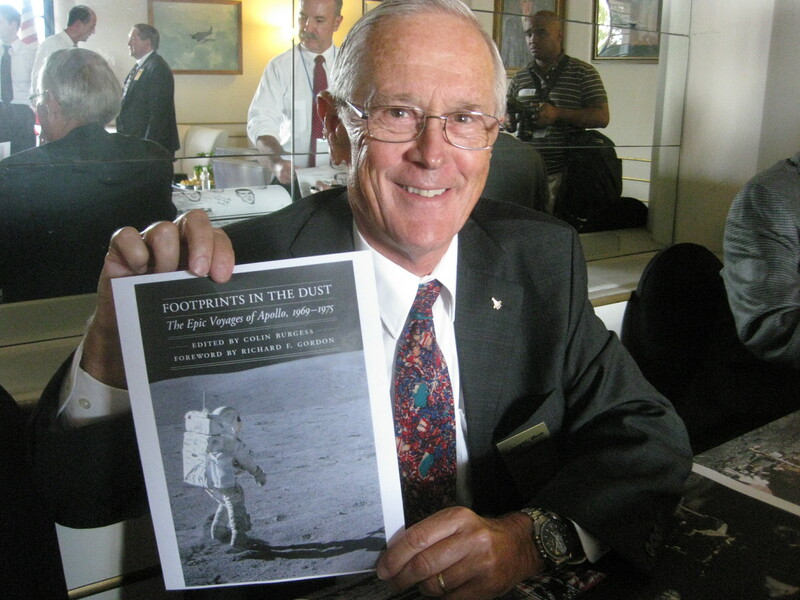 Apollo 16 moonwalker Charlie Duke holds a copy of the cover for Footprints in the Dust, which features a photo of Duke during one of his explorations of the lunar surface. I contributed the lead chapter to the book.Fourteen years ago — not long after the birth of our twin sons, as a matter of fact — I got the cover and first color proof pages of my first book, Second to None: The History of the NASCAR Busch Series. It was a day neither I nor my wife, Jeanie, will ever forget. Today’s e-mail brought back a lot of memories. Fourteen years ago — not longer after my twin sons were born, as a matter of fact — I received the cover and first proof pages for my first book, Second to None: The History of the NASCAR Busch Series. It was a day neither I nor my wife, Jeanie, will ever forget. Jeanie is a district court judge here in North Carolina, and that particular week, the boys and I had tagged along to a conference she was attending. She had already left for that morning’s first session when the call from the front desk came. Mr. Houston, a package just arrived for you if you’d like to come get it. I knew exactly what it contained. I had not showered or shaved yet. The boys were just beginning to stir and had … well … very, very full diapers. I didn’t care. I pulled on a pair of ratty shorts and threw the kids into their monstrous side-by-side stroller. We must’ve made for quite the pitiful sight, but off we went nevertheless. To get to the lobby, we had to go down a long hallway with large banquet rooms on either side. We made it to the front desk without being seen and tried to sneak back down the hallway to return to the safety and anonymity of our room. We weren’t as lucky the second time. At that exact moment, Jeanie’s conference took a break. Out of the rooms streamed every district court judge in the state of North Carolina. There I stood in the T-shirt I’d slept in, gym shorts, unshaven and sporting hair that might or might not have been combed, with boys whose diapers were already stinky … and getting stinkier by the second. Jeanie forgave me. I had my cover and my color proofs. They were beautiful. So were Jeanie and the boys, dirty diapers and all. This is my most memorable cover story. What’s yours? If this is your first book, what are your expectations for the cover? This entry was posted in Writer's Life, Writing and tagged Author, books by Rick Houston. Bookmark the permalink. I’m waiting to see the cover art now! It is quite the patience prodder. I’m artistic enough to have strong opinions about cover art so I really hope I fall in love with it . . . not the opposite! My publisher has a terrific designer though, and I have loved all of the covers of their books, so I’m optimistic that this will be a moment to CELEBRATE, rather than one to DEBATE. What a smile maker! Thanks so much for such great encouragement, Rick. Your story made me envision a book cover for the first time and I was surprised that a clear picture of that cover was lurking in my head. A bite of potential reality. Great encouragement!